Orange Crystals help to restore vitality levels back into your life as they nurture and support your real self, encouraging one to step up and shine ON. The color orange is located between red and yellow on the light spectrum. Orange, the color of the sun, represents the energies of vitality and activity. The mutable color of orange resonates and brings together the physical body (yellow), subtle body, and tantric energies (red). The blending of red and yellow also allows the color orange to support mind expansion with greater awareness. Orange symbolizes the process of emerging, heat, growth, traction, the bringing forth of vital energies and regeneration of spirit. Orange crystals represent the beginning stages or seeds of creativity; the fruition of creative ideas. Orange represents the perseverance of your labors and growth as seen with the abundance of the autumn harvest. Orange may also represent a flash of transformation due to unexpected change ~ think fire or explosion. Orange crystals support the energetic motivation for movement forward and positive change. Orange crystals energetically provide a balanced, grounded platform to let go and experience the creative flow in your life. Orange is the color of thoughtfulness and consideration toward others. 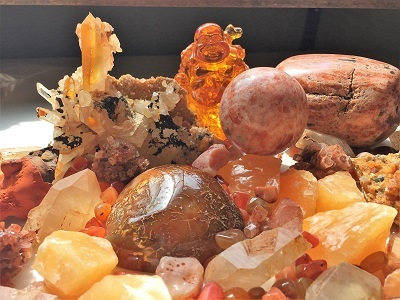 Orange crystals are a wonderful crystal tools to enhance social encounters and environments as they support congenial feelings of support and community. The color Orange assists with the assimilation of mental thought, as well as, with food nutrients. Ingest the energetic benefits of the color orange with some of these foods: Oranges, carrots, cantaloupe, orange lentils, and sweet potatoes. Physically, the color orange may be helpful in the support of the healing of bronchitis, kidney health and bladder functions, circulatory system, and in the treatment of cholera. The energies of the Orange ray resonate with the second chakra. Gorgeous smaller sized dark orange Carnelian tumble stones from the Brazil. Amazing and vibrant translucent orange to red-orange colored Natural Orange Kyanite Crystals. Nice translucent rusty brown colored multi-directional sputnik Aragonite Natural Crystal from Morocco. Nice translucent rusty brown colored Aragonite Natural Crystal "logs" from the Tozouta Mine, Sefrou Prefecture, Fes-Bouleman Region, Morocco. These pieces of Orange Calcite are a wonderful tangerine color with a waxy high sheen. They look like a piece of freshly peeled orange or grapefruit - all that is missing is the citrus smell. Orange Calcite polished worry stones with a wonderful tangerine color and waxy high sheen from Mexico. Gorgeous Carnelian tumblestones from the Sashe River area in Botswana, Africa. Beautiful naturally transparent with light orange to dark orange-red coloring Tangerine quartz crystal points from Brazil. Gorgeous peachy and sparkly Sunstone tumbled stones from India. Smaller sized dark fiery orange Carnelian tumble stones from Brazil.These carnelian tumbled stones are the perfect size for medicine bags, smaller crystal grids, crystal intention gardens, or orgone generators. Fiery orange Carnelian tumble stones from Brazil. Rusty brown colored Aragonite Natural Crystal with multi-directional sputnik protrusions from Morocco. This beautiful specimen of butterscotch colored Wulfenite crystals on Quartz matrix is from the famous Rowley Mine in Arizona, USA. Beautiful butterscotch colored Wulfenite crystals on Quartz matrix from the famous Rowley Mine, near Theba, Maricopa County, Arizona. Wulfenite is a stone of transformation, creativity and healing through Earth connection. Stunning butterscotch to golden yellow colored polished Golden Healer Quartz crystal sphere from Namibia, Africa. Sparkly Sunstone polished sphere from India. Stunning wispy butterscotch to golden yellow colored with rainbow veils polished Golden Healer Quartz crystal sphere from Namibia, Africa.